URBANA, Ill. – A University of Illinois plant pathologist is reporting that head scab of wheat (Fusarium head blight) is now showing up in portions of southern Illinois. In many cases, incidence of the disease is moderate to high (over 50% of the heads affected), explained Carl Bradley. Affected wheat heads will appear “bleached” in color. 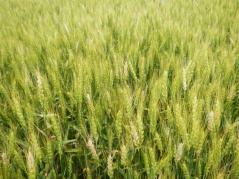 Bradley cautioned that wheat growers may want to evaluate the level of scab in their fields. “It is easiest to observe this disease before heads completely mature. Growers with moderate to high levels of scab should consider making adjustments to their combine that would allow low test-weight, scabby kernels to be blown out the back of the combine,” he said. Citing recent research conducted at Ohio State University, Bradley said that adjusting the combine’s fan speed between 1,375 and 1,475 RPMs and shutter opening to 90 mm (3.5 inches) resulted in the lowest discounts that would have been received at the elevator due to low test weight, percentage of damaged kernels, and level of the mycotoxin deoxynivalenol (DON; vomitoxin) present in the harvested grain.